If you’re familiar with the classic children’s novel ‘Pollyanna’, you know very well what the so-called ‘glad game’ is. (I wasn’t…embarrassingly I had to look it up…) If not, I’ll tell you in a nutshell: it’s making yourself think of something you can be glad about, even in the worst of situations. It’s basically thinking positive… it’s a game of optimism. 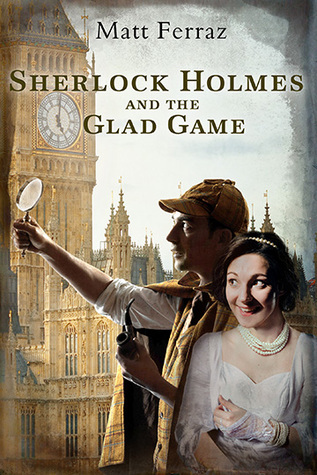 So when I read the title and the description of ‘Sherlock Holmes and the Glad Game’ (and then went and read about who this Pollyanna girl is…) I knew that I must read a book where Sherlock meets this game and this girl! Cynical, rational Sherlock and naive, optimist Pollyanna interact…? It must be hilarious! I was approached by the author Matt Ferraz (Facebook/Linkedin/Twitter) and was provided with a free e-copy of the book in exchange for my honest opinion. This was an entertaining book! I first was afraid that Sherlock and Pollyanna – these two things wouldn’t mix very well, the originals being so different, but it actually worked quite great. The style fairly imitates that of the original Sherlock’s and it goes unexpectedly well with Pollyanna and the mystery she brings to this novel. Pollyanna doesn’t lose herself in spite of it being more of a Sherlock Holmes than a Pollyanna story. The way she speaks stays true to her original version, it’s absolutely believable that it is the same person, yet she somehow seems a bit more realistic. I actually liked her character better here! I expected more actual interaction between Sherlock and Pollyanna, but it turned out to be more subtle and, I think, also more realistic than dramatic – which is definitely something I like. The mystery is good and interesting. The detective work/thinking and solution is more on a human scale than the usual ‘Sherlock brings his brilliance’ thing, but that was okay with me. Also, I have to admit that I was a bit confused for like the first half of the book about how Pollyanna’s life turned out since the ending of ‘Pollyanna Grows Up’, because it didn’t seem to add up. I save you the worry: it does. It’s all explained in due time. Just read the title! Isn’t it enough? It’s such a unique idea to bring these two very different classics together and see what happens. And it works great! This does sound quite good. And, yes, I’m old enough that I remember Pollyanna well. LOL! Great post! Great review Dora. I read Pollyanna years and years ago, so I do not remember a lot of it, but your review sure has me intrigued. Thank you!! 😘 I think it works if you only have a sense of Pollyanna. I hadn’t even had that, that’s why I decided to read it. Great review Dora! Nope don’t know what the glad game is! Glad you explained it! Tq! Gosh I can’t remember when I read Pollyanna! Guess it’s time for a revisit!